A few months ago, I had the great privilege of reading HAMMER OF WITCHES, a brand-new debut historical fantasy from author Shana Mlawski. A BOY main character! A unique historical setting! Awesome cultural interaction with Jews and Moors in Inquisition-era Spain and first contact with New World peoples. An intriguing fantasy world! What’s not to love? Her book came out April 9, so I thought this was an excellent opportunity to do a little interview with Shana, and give away a copy of this awesome book. Doesn’t that sound fun? I mean, more fun than traveling across the 15th century Atlantic on a boat the size of a teacup (more on that later). DIANA: Your first book, HAMMER OF WITCHES (which I loved), has a truly original premise. It’s about a young man from Ferdinand and Isabella’s Spain who discovers his heritage is way more complicated than he thought, and ends up traveling with Christopher Columbus to the New World. Wow. Can you tell me about the seeds that grew into this story? SHANA: Aww, thanks! The seeds for HAMMER OF WITCHES are really old. Years and years ago I traveled to Portugal and Spain and immediately fell for the architecture, of all things. I said, “I’ve got to set a book here.” The architecture I liked best was from the Moorish period, so I ended up reading a lot about Al-Andalus and the Reconquista (the series of wars various Spanish kingdoms fought to take the Iberian peninsula from the Muslim emirs). Eventually it became clear that my imaginary book on the subject would have to be set in1492, because that year a gajillion things happened. For example, Ferdinand and Isabella finished up the Reconquista by taking Moorish Granada, the Inquisition started to really ratchet up, and we Jew-folk were booted out of Spain. Oh, and that Columbus guy did something. At some point a mouthy14-year-old named Baltasar popped into my head and started being a nuisance. “Write me, write me!” he said. (But, you know, in Spanish.) What was I going to do at that point? I wrote him. DIANA: The concept of storytelling is central to Hammer of Witches. Magic is literally beholden to one’s knowledge of legends and folklore. Were you a big myth and fairytale geek growing up? What were a few of your favorites? DIANA: I think all writers are contractually obligated to envy Belle that library. SHANA: But I was into Greek mythology for a while, too. My favorite was the tale of Orpheus and Eurydice, mainly because of a beautiful watercolor painting of Charon in my illustrated book of Greek myths. Related: Everyone should go listen to Anais Mitchell’s Hadestown right now. Ani DiFranco plays Persephone and Justin Vernon is spectacular as Orpheus. Go go go! 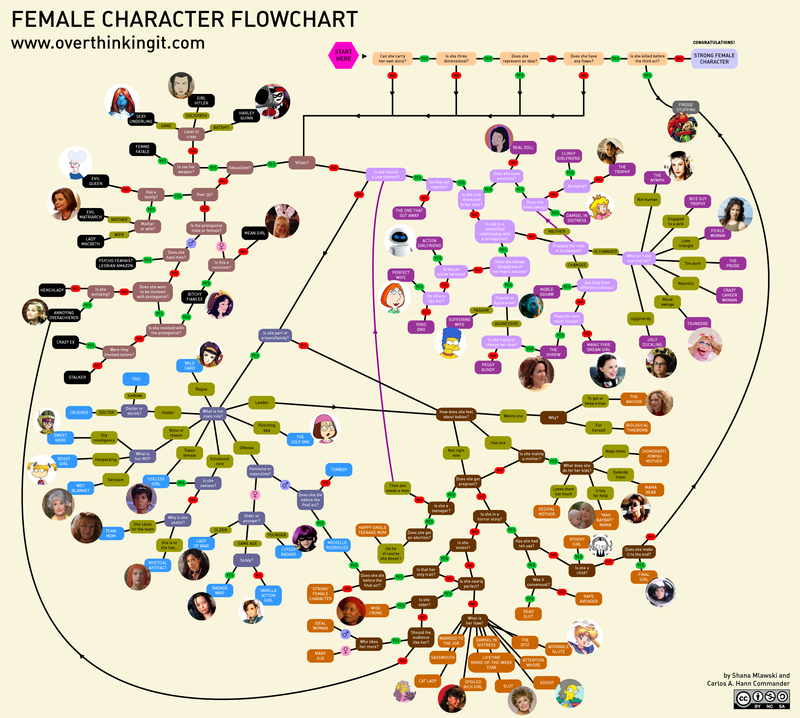 DIANA: You’re a well known online journalist through your work for Overthinking It, with ideas that have become somewhat of a meme in certain geeky cultures, like your female character flowchart and “strong characters, female”. When my husband found out I’d lent a quote to your book, he said “You never said it was Shana Mlawski’s!” How did you get involved in that site and what do you like best and least about online geek culture? SHANA: Overthinking It—the website that subjects the popular culture to a level of scrutiny it probably doesn’t deserve—was the brainchild of a bunch of Yale alums who wrote comedic halftime show scripts for the Yale Precision Marching Band, which is as nerdy and wonderful as it sounds. I, too, was a YPMB scriptwriter, and I was asked to join the team. Before long I became known as “that wacky feminist” and “the one who writes about LOST a lot.” Overthinking It gradually grew to include non-Yalie writers and a hilarious podcast that I am too awkward to be involved with. We geeks just have to be careful to add to the conversation instead of shutting it down. Nitpicking, group-think, and -isms like sexism and racism narrow the conversation instead of broadening it. A fandom’s got to be inclusive. The more people involved, the better fanart you get! DIANA: What do you think would be the worst part of traveling to the New World on one of Columbus’s ships (laying aside, for a moment, the potential of getting eaten by a Biblical sea monster). The smell. Imagine three-dozen sailors who have worn the same clothes for six weeks. In August. In the tropics. Doing difficult physical labor. Also there was bilge. Bilge is a thing that exists. The sleeping situation. Imagine three-dozen sailors sleeping on the deck of a ship roughly the size of a tennis court. The Spanish had not invented hammocks by 1492 (they needed to steal that brilliant idea from the Taino of the Caribbean), so sailors had to sleep on the floor, which often was quite wet. I’m enough of an insomniac as it is. Give me my pillow and fuzzy blanket or give me death! The seasickness. I don’t think they had dramamine back then. But by far the worst part would be the knowledge that there was a 99.9% chance I was never getting home. Contrary to popular belief, Columbus wasn’t the first non-Viking to try sailing west. We don’t hear much about the other guys, because they didn’t come back. There was little reason to think Columbus was going to have better luck. His calculations re: how long it would take to reach the Indies were laughably wrong. If there weren’t two continents blocking his way to Asia, he would have been screwed. DIANA: What’s next for you? SHANA: I did go to Yale, but I can’t tell you if I’ve read Secret Society Girl. It’s a secret. SHANA: Definitely want to join the volleyball team, though. We can be the Fighting Writers. The Writing Fighters? Hmm. I’m going to have to think about this. Based on the interview, this book sounds like a lot of fun! I’ve personally always found the story of Columbus interesting, so to have this set in that time period is VERY intriguing indeed. Plus, I’m a fellow mythology geek! This book looks awesome! I loved learning about that period in my college Spanish classes. The only downside is it’s making me regret my decision to pass on an opportunity to go to Southern Spain this summer! So glad I visited twitter today and saw this! I am looking forward to this one lots. Fantastic giveaway! Really looking forward to this. BYU alum here… Would LOVE to read Shana’s debut novel! I read your For Darkness Shows the Stars twice in three days. Read into the night. First time through, I read just as fast as I could. Second time, I savored the story. Loved it. I recommend it to every Austen fan I know. Highly. Can’t wait for my daughter to read it one day.